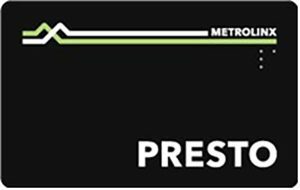 PRESTO card holders receive 30% off their first year of Membership (full price $99 + tax). Sign up below, and enter the 17-digit number on the back of your PRESTO card to receive your discount. Bike Share Toronto is an enjoyable and cost-effective way to get around town. Use bike share to commute to work or school, meet up with friends, sightsee, and more. Become a member to gain access to 3,750 bikes throughout Toronto. Take as many 30-minute rides as you want while your membership is active. The first 30 minutes of each ride are included in your membership. Extra usage fees apply after 30 minutes. Join now to save 30%! PRESTO is a state-of-the-art electronic fare payment system available across 11 transit agencies in the Greater Toronto and Hamilton Area and Ottawa.